UNSC Battle Group X-Ray was the first fleet given to Admiral Cole to attack the Covenant at the Second Battle of Harvest in March 2526. 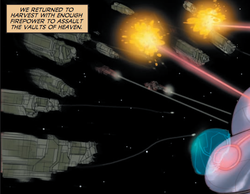 The fleet engaged the Covenant over Harvest, and due to a last moment of tactical inspiration on the part Admiral Cole, Battle Group X-Ray managed to destroy the Covenant super-destroyer in orbit. In 2526 a smaller section of the Fleet, named Task Force Yama and consisting of fifteen Razor-class prowlers split off from the main Fleet and participated in Operation: SILENT STORM and the Battle of Biko, under the command of Captain Halima Ascot. The battle group was disbanded or transferred to another flag-officer sometime prior to the Battle of Psi Serpentis, as Admiral Cole then commanded UNSC Battle Group India. Admiral Preston Cole, commanding officer of Battle Group X-Ray. The bridge of Everest, Battle Group X-Ray's flagship. X-Ray is shown on the left side of the tac-map with the Covenant ship on the right. Battle Group X-Ray during the initial assault on the Covenant super-destroyer. Admiral Cole reaches a eureka moment in the Second Battle of Harvest with X-Ray on his tac-map. Battle Group X-Ray destroys the Covenant ship at Harvest.